Every Leafs fan has an opinion. Here's mine: We are all Pension Plan Puppets. The Teachers pull the strings and we dance. It is my distinct pleasure to announce that yours truly will be the latest blogger to begin writing for SportsBlog Nation. In their infinite wisdom they have decided to allow me the exposure to a larger audience. It will continue to be called Pension Plan Puppets (until I vanquish the OTPP) except now I get my own URL(! ), a funny logo (or an obvious one if you want to be a jerk about it), and the tools to build a community for Leaf fans. The main tool at my disposal will be JFJ. Just kidding. It's what SB Nation calls a diary which in essence allows members (sign up!) to carry some of the conversation by writing their own blog posts. A more complete explanation and some guidelines can be found in the easy to follow post "Where Am I and What Do I Do Here?". Any good site is more of a conversation than a sermon from the pulpit so I hope that you'll stop by, sign up, and join in the discussion. Everyone associated with God's Team will remember Game 6 of the 1993 Western Conference Finals when this douchebag blew the easiest call of his career. 15 short years later Leafs' fans will finally have some measure of revenge. No, Kerry Fraser is not going to be hung from the rafters and beaten like a candy-filled pinata but Mike Myers is defiling the LA Kings' jersey by putting Justin Timberlake on the team and some people are upset. I remember seeing "Toronto Maple Leafs win Stanley Cup" scrolling across the screen during Austin Powers (III?) and laughing. Leave it to a Leafs fan to take things into his own hands and make a moving in which the buds win the Cup. I guess it's that attitude that explains why we always want to play with Leaf teams in the EA NHL games. Anyway, let's all laugh at the Kings. Looks like Mats has a new SBP in his life. No, Alfie is not getting traded to the Leafs. Mats is dating new girlfriend Josephine Johansson. A Google Images search has turned up these entries for Mats new plaything (25? Way to rob the cradle Mats!) and I assume that she is the fetching blonde and not the first image. Any confirmation would be appreciated. This was got dropped in the comments and I thought that it would be something worth bringing to everyone's attention. Hockey4Life is offering you the chance to play in a fantasy hockey tournament with proceeds going towards saving lives, right here in our community. When you register to play in the hockey tournament, you will receive a $150 hockey sweater, tickets to an amazing house party/concert, three games in the tournament including the third game with 2 professional hockey legends on your team. There are also playoffs and the celebrity hockey game that you can play in. Proceeds from Hockey4Life events go to The Mikey Network to place life-saving defibrillators and the related training into our hockey arenas. Your team can donate the defibrillator to your local rink or keep it for you team. Naturally, EMS will train up to 8 members of your team on how to use the defibrillator. For more information, or to register for the tournament please contact Adena at (905) 763-1200 or adena@integratedmar.com. You can also access more information on our website www.hockey4life.org or here. It's definitely a good cause to support. Defibrillators helped save Jiri Fischer's life and in a country where far too many people play hockey when completely out of shape (and far too old) you could be saving the life of someone you know. The nutritional value of gruel sandwiches might make it tough for Bell to stay in shape. So this is why the GM needs an advisor. I joked about the Leafs being charged with crimes before but I didn't think Mark Bell would get convicted. Too bad he's a hockey player in California. They treated him like a normal citizen. I'd like to think that the Leafs were aware of this considering some sens fans at the BoO (Damn you Notch!) were aware of this at the time of the trade. Needless to say, the denizens of Leafs Nation are up in arms and with good reason. The sentence might not start until after the season but as one friend put it "you think Bell will be able to concentrate on hockey with his new cellmate Tito weighing on his mind?" JFJ knew about the pending case and decided that either the odds were good that Bell would not be sentenced to jail time or that he wouldn't convicted. In either case, getting Toskala was worth it in his eyes. JFJ was completely caught off guard and had no clue that Bell has both a drinking and a driving problem. Leafs' GM John Ferguson had little to say when reached by Sportsnet. "I will reserve comment until I can more fully review the situation," he said. If the team knew then they should have been prepared to deal with any result. Bell is far from the first NHL player to get in trouble with drinking and driving and some have been able to recover from their mistake to have productive careers (Heatley, McTavish). Sadly, Bell won't even be the first Leaf to have had problems. That article cites Rob Ramage, Jamie Macoun, Tim Horton, and Miroslav Frycer as other alumni that have distinguished themselves as morons. Hopefully, Bell learns from his mistake as does JFJ although I'd like to imagine that he will be doing his learning in the unemployment office. Update: In all of the smug self-satisfaction we should all keep in mind that Bell has yet to be sentenced. Mirtle noted that Bill Watters brought this up on Leafs Lunch. Maybe there is a deal in place that we are not aware of and the MSM jumped on the 6 months in the clink angle too quickly. He could just get community service and a fine. What's wrong with this train of thought? When the Leafs have a player like the 28 year old John Pohl (who I like but is unbelievably expendable) why would they think about trading 23 year old Matt Stajan just so that they can sign the 33 year old Mike Peca who is coming off of a major knee injury? These are the Maple Leafs!! They have money to burn! They can sit a couple of million dollars in Ricoh Coliseum without batting an eye. It is the Leafs' easiest way to get around the salary cap. 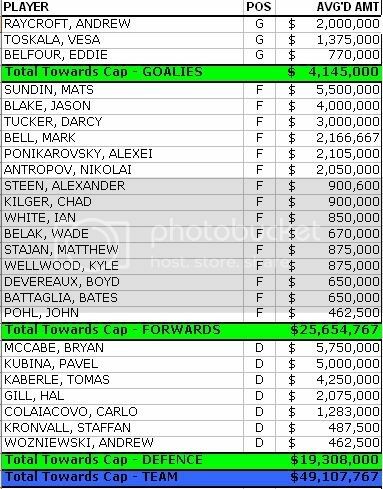 That does not even bring up the idea that if they have roughly $2M in cap space why do they need to clear any more room? Is Peca going to be making close to what he made last season? He just came off his second major knee/leg injury and was not that effective last season. Yes, he would improve the PK but Blake also contributes greatly to an improved PK and the upgrade in net will play a big part in shoring up a PK unit that went downhill fast after Peca's injury. My main problem with this deal is that after JFJ has held off trading actual young players (unlike picks who are only theoretically young players) he is now potentially going to let a Toronto drafted player that has improved every season. The marginal benefit gained between a healthy Peca and the Stajan of last season is not enough to justify letting Stajan's potential go. I cannot wait until we trade Steen in order to sign Lindros! Opening Night is still a ridiculous two months away and free agency is winding down (quick! someone sign Yashin!) but the pre-season schedule has been released. Sadly, this is becoming the only time that the Leafs will see some teams. This year's schedule has two Red Wings games in addition to the February 9th tilt but if the league continues with its scheduling format pre-season will be the only time that these two rivals will meet for two seasons. Toronto will also tease Winnipeg with a taste of 'NHL Hockey' with a game on September 19th. Just to rub salt in the wounds they'll be playing the team that flew the coop, the Phoenix Coyotes. Actually, looking at their roster, Winnipeg is probably better off. These games will all be on LeafsTV so odds are that most fans won't get a good idea of what the Leafs can do until the season starts. Fear not, I'll be watching the games and writing game recaps to let you know who plays with Blake. I became a fan in the 80s. I lived through Allan Bester's fivehole. I saw grown men cry when Gretzky scored a hat-trick in THAT game 7. I drove 160km/hr to get to a Yonge Street parade. I remained a Leafs fan even though Ottawa got a team. I spent an entire paycheque to see Game 3 against the Canes. I live and die with the Leafs. That makes me a real fan. These are my thoughts.